Explanation: Once the famous sunset comet, PanSTARRS (C/2011 L4) is now visible all night from much of the northern hemisphere, bound for the outer solar system as it climbs high above the ecliptic plane. Dimmer and fading, the comet's broad dust tail is still growing, though. This widefield telescopic image was taken against the starry background of the constellation Cepheus on May 15. It shows the comet has developed an extensive anti-tail, dust trailing along the comet's orbit (to the left of the coma), stretching more than 3 degrees across the frame. Since the comet is just over 1.6 astronomical units from planet Earth, that corresponds to a distance of over 12 million kilometers. 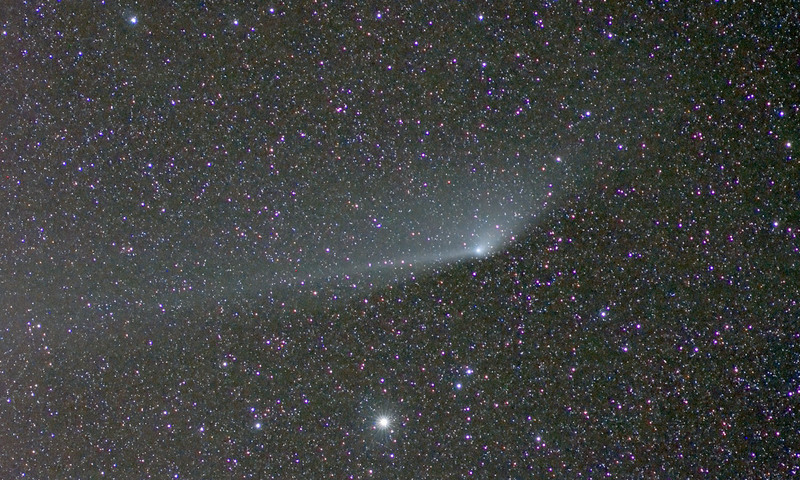 In late May Comet PanSTARRS will pass within a few degrees of the north celestial pole.